Werner's Cairns blog: The Effective Sweet Treat that Relieves Arthritis Pain. The Effective Sweet Treat that Relieves Arthritis Pain. I suppose that pain is an inevitable part of life, yet it is something we would rather be without. However, pain is a body signal that there is something amiss. There is now a myriad of chemical pain killers available, but most of them are chemicals that can have unpleasant side effects. Consequently a lot of people have now discovered that there are natural alternatives for stopping or reducing pain without any side effects. Please go to this link and see how my wife, Karola, stopped her excruciating pain with Turmeric. Pain can be relieved the natural way without chemical drugs. There are also the Chia Seeds that give among other things, pain relief as well as energy – and more. Karola now also takes Chia Seeds, one big tablespoonful in the morning with cereal and one in the evening with yoghurt. Scroll down to my previous posting. Chia seeds; a superfood and a way to good health. I have osteoarthritis stabilised by knee exercises, and Glucosamine and Chondroitin for the last 8 years while a few of my peers had knee replacement during this time. Last November I went to Hanoi Bay, and did quite a bit of climbing that aggravated the pain in my right knee, and started the pain in the left. Still I persisted with my medication and knee exercises. It gave relief up to 70%. One of my favourite fruits is pineapple. I realize that for weeks since my trip to Hanoi I have not eaten any pineapple. I really missed that so went out to purchase one and walloped one big piece heartily. Lo and behold, next morning when I started my exercises, the pain was nearly gone. There was around 95% relief. Thinking it was the benefit of the exercises I increased the momentum another 5 to 10 minutes. Later in the day I began to think how could the pain decrease so much overnight. Aha! The only difference was the pineapple that I ate. Yes, you guessed it, I went and walloped some more and obtained more relief. Back to before I went to Hanoi Bay. Happy but too shy to tell anyone until my sister rang up to inform of her back ache and unable to stand straight. I rebuked her for not doing anything like rubbing ointment or seeing a doctor. Jokingly informed her of my pineapple experience. Laughingly she said she was going to try that. A week or so later she came over and proudly showed me that she could walk straight without any pain. With thumb up she informed that the pineapple worked. So friends if you or anyone you know have arthritis pain, pineapple is worth the try. (So you have it straight from the "horse's mouth's", so to speak. - Werner) Following is now the title story. Did you know that there are certain kinds of foods that actually help reduce or even stop arthritis pain? These "superfoods" are usually easy to find and inexpensive. Of all the foods that help fight against arthritis -- delicious, sweet pineapple comes up close to the top of the list. Higher intake levels of the antioxidant vitamin C is essential for people with arthritis... And just one cup of pineapple has a whopping 94% of the recommended daily allowance (RDA)! Research published in the Annals of the Rheumatic Diseases showed that vitamin C-rich foods protect against inflammatory polyarthritis, a type of rheumatoid arthritis in which two or more joints are affected. If you have osteoarthritis, you may be concerned by warnings that you should not increase your vitamin C intake. But know that those warnings are based on a 2004 study on guinea pigs! Studies on humans show vitamin C actually reduces pain, cartilage loss and disease progression. Pineapple is a great source of the trace mineral manganese. Manganese is absolutely essential for building healthy joint tissue and dense bones. 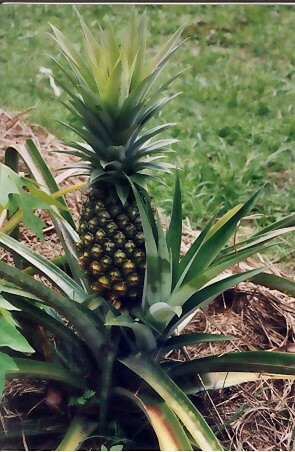 One cup of pineapple provides 128% of the RDA for manganese. Research shows that manganese tackles free radicals that can damage joint cartilage. Tip: It's best to eat your pineapple raw. Fruit skewers; alternating fresh pineapple chunks with strawberries is a great way to do that. Grilled and cooked pineapple is extraordinarily tasty too. Pineapple's enzymes literally clean up "rusty" joints. When you eat pineapple on an empty stomach, the enzymes go right to work on your joints. Tip: If you eat pineapple with other foods, the enzymes divert their activity to digesting the rest of your meal instead of the gunk in your joints. So keep pineapple around for between-meal snacks. Juice the hard inner core as well to take advantage of the concentrated bromelain located there. For optimal arthritis pain-relief, eat fresh pineapple. The bromelain in pineapple is destroyed by heat, so fresh pineapple will give you the most benefit. Frozen pineapple retains active enzymes, but canned fruit and commercially processed juice don't provide the anti-inflammatory benefit of fresh fruit. It's important to note bromelain causes anti-clotting activity... So you should consult with your physician before combining pineapple with blood-thinning medications such as warfarin (Coumadin), heparin, or aspirin. *Reason #5: Protection from Inflammation. in fresh pineapple is one of the best-researched natural anti-inflammatory agents around. Bromelain clobbers inflammatory agents that trigger joint pain and cartilage degeneration. A 2006 study cited in Clinical and Experimental Rheumatology found that supplemental bromelain is effective in easing discomfort from hip arthritis. The Arthritis Foundation stated that pineapple's bromelain produces effects comparable to NSAIDs for relieving pain and inflammation. UK researchers reviewed ten studies on osteoarthritis and bromelain. They found that every single one confirmed bromelain's benefits. Tip: Most of the bromelain in pineapples is found in the core and the stem. So don't throw away that tough, fibrous core! Just chop it up, throw it in a blender with some water and pulse to convert it to juice.